This red-brick beacon to mariners almost sank into the sea itself, but was rescued in 1993. 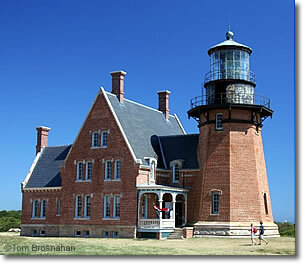 Block Island's Southeast Lighthouse, just off Spring Street, sat at the edge of the bluff for decades. Erosion of the bluffs brought it perilously close to tumbling into the sea. A grass-roots Block Island residents' effort saved it, moving it farther back from the precipice. Though decommissioned, it is still a beloved landmark, now open to visitors who can walk on its grounds and see its small museum and shop for free, and take guided tours of its tower for a small fee. The view of the bluffs and Vail Beach is fine from the surrounding lawns.